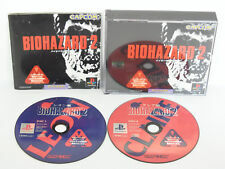 New ListingResident Evil 2 PS1 Discs Only TESTED acceptable LEON CLAIRE FREE SHIPPING! Both discs are tested and working great! They have minor scratches but function perfectly. RESIDENT EVIL 2. Discs like new, no booklet. RESIDENT EVIL 2 - Sony PlayStation 1 (PS1) 2-Disc Game w/Manual CAPCOM. Condition is Very Good. Shipped with USPS First Class Package. RESIDENT EVIL 2 PS1 (2) DISCS GOOD, No Manual S2 playstation 1. Condition is Good. Shipped with USPS First Class Package. Both disks have scratches as shown in photos. Photos show condition of case disks etc. Just like the original Resident Evil, players can choose to play as one of two possible characters. Although Claire and Leon team up, they are soon separated and trapped inside the city by a car crash. Trending at $66.66eBay determines this price through a machine learned model of the product's sale prices within the last 90 days. Unfamiliar currency?. No problem! You can then pick up the item at your convenience. Format/System:Sega Saturn. You can also do it over the counter at your local bank. Are you interested in this item but think the price might be a little bit too high?. Does not have manual or artwork. Has both disc 1 and 2 and the case. Disc 2 Has a lot of surface scratches. Both discs have been tested working. I DO NOT know the history of the item unless stated otherwise. Trending at $29.45eBay determines this price through a machine learned model of the product's sale prices within the last 90 days. PS1. Resident Evil 2 (PAL AUS/EUR) Sony Playstation game. I'll be happy to reply as soon as I can. Resident Evil 2 for the Playstation. Condition is Good. The disk are in good shape. PlayStation one. Disc 1 replacement disc for Resident evil 2. Playstation 1, good condition. Tested working. Includes the Leon story. Includes game disc only. Surface scratches do not affect playability. Item:Biohazard 2 (II) RESIDENT EVIL. Format/System:Sony PlayStation 1. You can then pick up the item at your convenience. Are you interested in this item but think the price might be a little bit too high?. Condition is Acceptable. IF THIS DISC DOES NOT LOAD IT IS A FAULTY LASER IN YOUR CONSOLE NOT THIS DISC. Discs are also run through a sector scan in VSO INSPECTOR to be sure this disc can be read 100% of the way through to protect us from "disc freezes half way through playing. Cases are excellent and manuals are mint. Discs are free of scuffs and scratches. Payment is due in 48 hours. Be sure to look at my other listings! Thank you for looking! Platform: Sony PlayStation 1. Condition: Good. Notes: Tested. SKU: SD92567. The game is in very good condition and is guaranteed to work. The case has a broken hinge as shown in the pictures. Resident Evil 2 (No manual). Playstation 1. 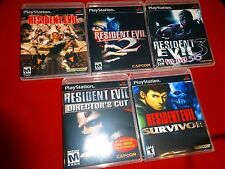 Resident Evil 2 & Director's Cut Lot Bundle (PlayStation PS1) TESTED FAST SHIP. Tested and work great. Resident Evil 2 is missing the manual. Some regular wear to the cases, sticker residue on the front of Resident Evil 2, and one crack on the front of Director's Cut, but are in good condition otherwise. Contents of both games are in very good condition overall. Format/System:Sega Saturn. Unfamiliar currency?. No problem! You can then pick up the item at your convenience. You can also do it over the counter at your local bank. Are you interested in this item but think the price might be a little bit too high?. Resident Evil 2: Dual Shock Version (Sony PlayStation 1) Complete CIB PS1. Condition is Very Good. Shipped with USPS First Class Package. This is the original, Black Label version. The corner has a crack that makes it a little wonky to open, but looks great on a shelf and is adequate for storage. The outer case is scratched, cracked and scuffed. Our goals are to provide you with. Discs are in excellent used condition with little wear, manual is like new , case has some wear. PS 1 Game Lot! Resident Evil 2 Directors Cut, Parasite Eve, ETC! Parasite Eve. Big Rig Pinball. Resident Evil 2 Directors Cut. in Mint condition discs mint. Resident Evil 1 2 3 Complete w/ Cases Manuals PS1 Playstation 1 Black Label. Condition is Good to very good. Discs may have light scuffs/scratches but play fine! Resident evil 2 ps1 Playstation one Complete Black Label. Condition is Very Good. Shipped with USPS First Class Package. Since its becoming way too frequent with order canceling and reason being the cat did it or my kids were playing with my phone. Resident Evil 2 PS1 Discs Only TESTED acceptable LEON CLAIRE FREE SHIPPING!